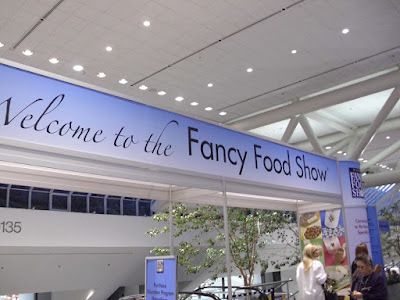 The Winter Fancy Food Show. If I had to describe this show in one word, I don't think I could. Not only because I've always had issues with brevity, but because as a first-timer to an event like this, there really isn't just one word to capture the experience. It's amazing. It's crowded. It's overwhelming. It's BIG. The NASFT (National Association of Specialty Food Trade), a non-profit trade association focusing on fostering interest, commerce & trade in the specialty food industry, hosts the Fancy Food Show twice a year. 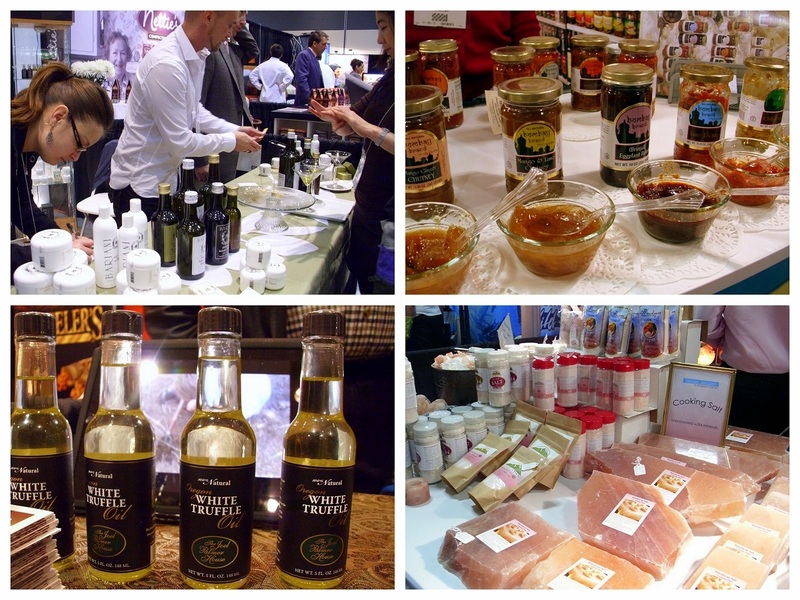 Held once on the West Coast and once back East, the events showcase the latest & greatest products, companies and trends in the specialty foods & beverages industries. Last weekend, the Winter Fancy Food Show was held in my favorite city, San Francisco. After learning I could attend this great event as press, I took advantage of the holiday on Monday, and hitched a ride with my pal Catherine of Munchie Musings to get my food show on. By the time we dealt with some minor parking headaches (welcome to SF!) and secured our press passes, the show was well underway and packed with people. Catherine, who had attended the show last year, came prepared with a map highlighting the vendors she was most interested in meeting. I figured it was best to stick with her since she knew the drill, and we started off with the exhibits in the North Hall, which featured the California regional exhibitors and the Natural & Organic Pavilion. I was glad I hadn't eaten breakfast that morning, because the second we stepped inside, we were inundated with samples of everything you could possibly imagine. Cheese, Filipino ice creams & frozen meals, gourmet marshmallows, chocolate, olive oils and specialty vinegars, health bars; you name it, we tried it, and that was just the first row of exhibitors! With my passion for everything spicy, I automatically gravitated to most of the booths having anything to do with hot sauces or salsas. Though I tried some intensely hot salsas, I never did muster up the courage (or tolerance) to try the ridiculously popular Ghost Chili sauces. But Ghost Chili was everywhere! From straight Ghost Chili sauce to salsas combined with fruits to soften the blow of the extreme heat, Ghost Chili is definitely the chipotle pepper of 2011. As fancy mocktails are growing in popularity for those who prefer not to drink alcohol, so are the faux wines. Gone are the days when sparkling apple cider was the only elegant non-alcoholic option to serve at a dinner party. 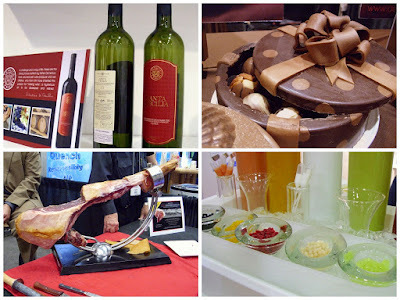 I saw many exhibits featuring non-alcoholic wines & sparkling beverages. 12 Noon to Midnight features sparkling beverages using different fruit & herb infusions, while Vignette Wine Country Soda actually uses the juice of the same grape varietals found in wines like Pinot Noir, Chardonnay and Rosé. Even though I'm a huge wine lover, I could see myself being perfectly happy sipping on one of these sodas during a nice picnic or something. Definitely a trend worth watching! Herb-infused and palate-cleansing waters were also prominently featured at the show. I had a fun "water tasting" at Ayala's Herbal Water, and tried several of their most popular flavors, including Ginger Lemon Peel, Clove Cinnamon Cardamom, and Lemon Verbena Geranium. Not being a fan of most flavored waters currently on the market (I like my water to taste like water), I was happy to note that not only were they very refreshing, they still tasted like... water! I got to take home a bottle & just discovered that Ayala's is also sold at the Sac Natural Foods Co-op, so I'll probably pick up a few bottles next time I can go play - er, shop there. Ethnic foods were also quite popular, with on-the-go varieties like Sukhi's Naanwiches and frozen Filipino, Indian, and Persian meals, for those nights you don't want to go with the old Chinese or Italian standbys. The ones I tried were all fantastic and tasted pretty authentic, so it should be fun to see these brands slowly make their way into more mainstream grocery store chains in the next couple of years. My beloved quinoa was everywhere! From everyone's favorite whole-grain company, Bob's Red Mill, to the more restaurant industry-specific Roland Foods, and even smaller distributors like Zócalo Gourmet, everyone was extolling the virtues of the mother grain. Zócalo Gourmet even showcased quinoa's smaller, cuter cousin, Kañiwa, which packs even more protein & nutrients than quinoa into its tiny amaranth-sized grains. Definitely one to try soon! But in general, quinoa was definitely the rock star of whole grains, even being used in some sensational salmon tapas made with Quely products by award-winning Chef Javier Soriano. The quinoa obsession seems to be spreading everywhere! 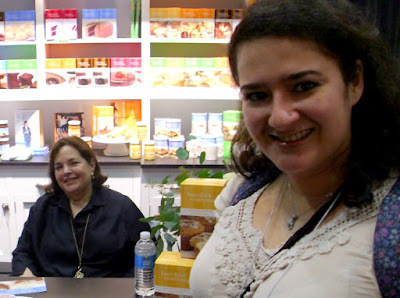 But the biggest highlight of my day was getting to meet the Barefoot Contessa herself, Ina Garten!!! I was just wandering along, checking out all the different booths, when I saw an exhibit with some of her cake mixes, jams and curds. When I looked up after sampling a bit of the lemon curd, I was blown away to find she was sitting right there, chatting away with one of the industry reps. In my most undignified moment of the day, I gushed about how much I admired her work, gave her one of my business cards, and got an autograph & picture with her. I'm used to doing this sort of thing after seeing one of my favorite bands in concert, but apparently my fan-girliness extends to celebrity chefs, too! Believe it or not, all of this was in just one hall of the gigantic show. I took a short break to rest the toe, then made it over to the other hall, which featured the International Pavilion and all of the charcuterie and cheese one could possibly hope to sample. This is where I stepped into a wonderland of all the things I only wish I could eat on a regular basis, while ambling along cobblestoned pathways in France or Italy. Luckily, France, Italy, Spain, Wales, Argentina, Japan and even Tunisia were brought to me instead. Since I'm a total francophile, the French exhibit in the International Pavilion is what I hit first. I was in cheese heaven, sampling Brie, Camembert, Manchego, Roquefort, and a million others I don't remember. It really seemed that most of the French exhibits were cheese, and with good reason! But there were other fun exhibits, featuring specialty hors d'oeuvres, escargots that are frozen & ready to go after a few minutes in the oven (they were exquisite, by the way), and some lovely fruit purees that had undergone the molecular gastronomy process of spherification to make fruit caviar & fruit "injections". I was hoping to sample some French wine, but either I was too cheesed-out to notice if they had any, or they just didn't bring those vendors to the show. Clockwise from left: Montepulciano d'Abruzzo, artisinal chocolates, fruit caviar & Iberico ham. Fortunately, the Italians had brought all their best wines and olive oils, so I happily sipped and slurped my way through that exhibit after visiting France. My absolute favorite wine of the day was this gorgeous Montepulciano d'Abruzzo from Tenuta I Fauri. I won't pretend to know all the proper wine terminology, but the way I interpreted it, this deep ruby red wine was full of complex spicy & fruity flavors, and by far the best Montepulciano I tried that day. Many of my fellow tasters seemed to agree, so that particular booth remained busy with folks from all over the world. The olive oils were so many in number that I can't even recall all the brands represented, but I was in olive oil heaven! I was also happy to note that a few of our California olive oils can give some of the Italians a run for their money. After Italy, I visited Spain and tried a bit more wine (fabulous) and Iberico ham (incredible), and trolled through the German, Japanese, and Welsch aisles, all of which cemented my belief that in the next few years I must make it a point to do some serious traveling. I'm so into culture and food and the culture of food that it seems almost criminal to stay in one place for so long when there's so much out there to explore. All in all, it was an incredible, overwhelming day that left me with very sore feet, but it was definitely worth the trip. I think next year I'll go for a couple of days to make sure I can process it all more calmly. But I made some great connections with some of my favorite exhibitors of the day, which means there should be several new product reviews coming in the next few months. Stay tuned for those, and keep your eyes peeled for a couple new recipes! Happy Weekend, everyone! What a marvelous account of your experience at this event... I was smiling the entire read! I, too, would have roamed EVERY aisle. You got the icing on the cake when you met Ina Garten - a special memory to last a lifetime. Thank you for sharing! What a lovely experience you had. Thank you for sharing it with us! I love going to the food shows! They are overwhelming though, did you notice any candy trend? I hope you share with some good giveaways too! ok so, I sooo want to go to this next year! 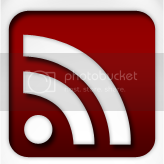 thanks for sharing and awesome site! Fun...and meeting the Barefoot Contessa, would be magical. Love her!